This fabric was originally up for consideration for the Meringue skirt, but as I mentioned in that post, I was so hesitant to work with vertical stripes. I had always wanted to do a striped version of Ginger. I love the illustration of version 3 on the pattern envelope, with the stripes going in a Chevron shape. It wasn’t a hard decision to use the fabric for this skirt instead. This is my third time making this pattern, and it just keeps getting easier. The pattern pieces are already cut to size, and I know how it fits. This time I decided to mix things up a bit, and add some piping. I think piping may be my new favorite sewing notion. It’s so easy to add to a garment and can completely change the look. 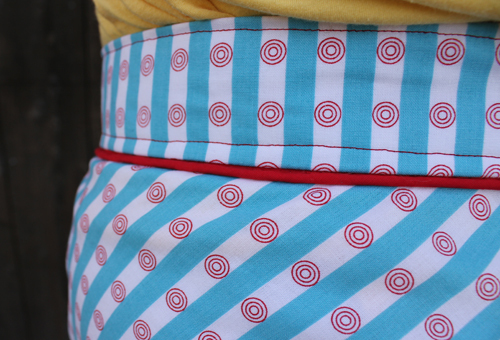 I went with a bright red, that matched the circles in the fabric print. I love the red piping and thread with the print. 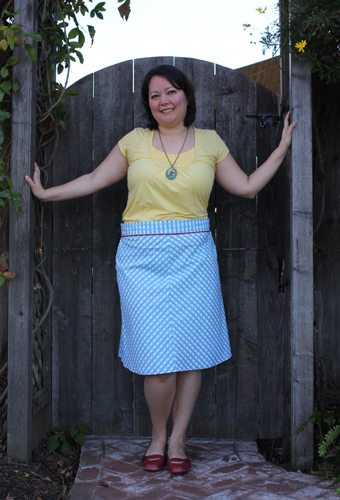 From cut to final hem stitch, the skirt only took me 3 and a half hours to make. It would have been even less if I omitted the piping, but I love how it looks. I’ll be wearing this all Spring and Summer long. I'm also wearing my Now Voyager necklace from Lauren Blythe Designs. It's one of the first items that I purchased from her and one of my favorites. 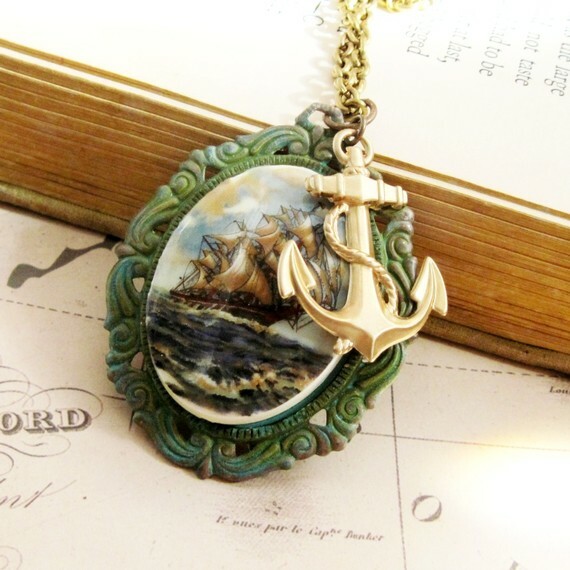 The skirt feels very nautical to me, so I thought this necklace was a nice fit. What are your go-to patterns? Things that you know you can whip up in a short amount of time, with little effort? Very nice! I like the piping too. My favorite thing to make has no pattern, it's a simple 45" square that I make into a receiving blanket. I started doing that when I was expecting my first child. The ones you get in the store shrink up so much so I just started making my own. Both of my girls still have one of their receiving blankets and they are 16 and 9. That's a wonderful idea and it's so great that they still have theirs! I've been thinking about making some up with leftover fabrics combined with flannel or a soft minky for some friends that are having babies. I've seen some tutorials floating around the web but I love patternless projects! You are so cute!!! And that piping is too! Love this and the piping is great! My go-to pattern is the Simplicity reissue 1940's high waisted trousers...love that pattern! Oh now that I'm not so afraid of pants I'll have to put those on my list! My "goto" pattern always was a sheath dress. I just got the colette book and it I may have to try the meringue skirt. It looks so adorable. You are an inspiration. How do you find the time to sew so much? For me, it's really only weekends. Thank you! I really just try to squeeze time in whenever I can. I've actually gotten behind in my 'live' tv shows because I've been wanting to sew more, so I watch a lot of dvds from our collection or from NetFlix. I mainly sew during the weekends but sometimes I can squeeze time in a couple of nights during the week. 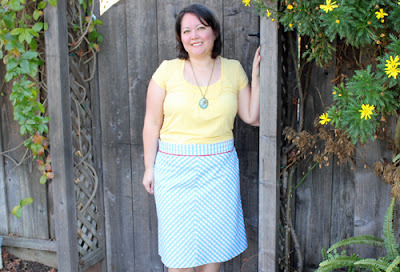 This skirt is just fantastic! The piping makes all the difference, and I just love the print you used!! !